The United Kingdom Hydrographic Office (UKHO) is an organisation within the UK government responsible for providing navigational and other hydrographic information for national, civil and defence requirements. The UKHO is part of the Ministry of Defence and has been charting the world’s oceans for over 200 years. The UKHO is the power behind the world-renowned Admiralty brand of products and services covering marine, defence, leisure and hydrographic expertise. Cowes Harbour Commission (CHC) uses UKHO charts in the promulgation of navigation safety information, including the Cowes Local Notices to Mariners. 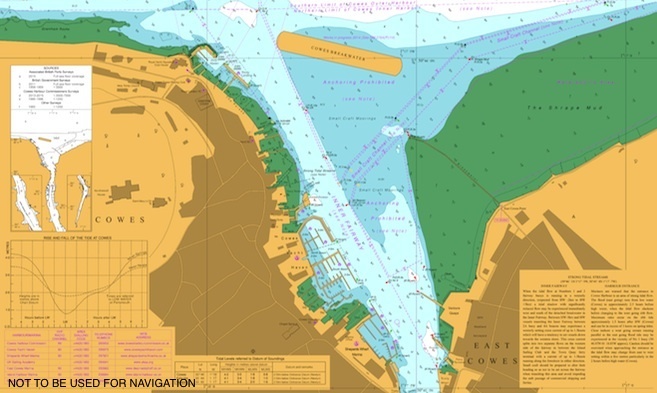 A new edition of the UKHO Cowes chart 2793 was published on 18th June 2015 with various updates including the footprint of the Cowes Breakwater under construction, a 'works in progress' legend for the breakwater, the new 4A beacon, and an updated cautionary note on the cross-fairway tidal flow in the Inner Fairway. Visit the UKHO website for information on UKHO products and services, Admiralty digital charts, and Admiralty paper charts. © Crown Copyright and/or database rights. Reproduced by permission of the Controller of Her Majesty’s Stationery Office and the UK Hydrographic Office (www.ukho.gov.uk).